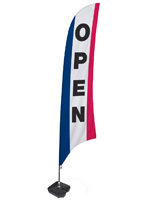 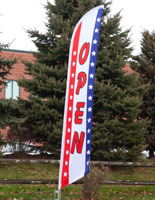 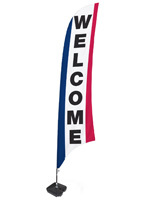 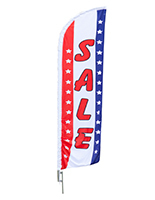 Stock patriotic feather flags featuring red, white, and blue designs come in a wide variety of messages suitable for almost any business. 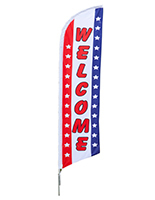 We sell outdoor marketing displays that target specific industries as well as simple and to-the-point sayings such as "SALE", "OPEN", and "WELCOME". 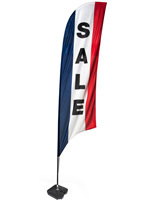 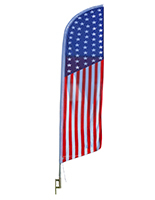 In addition to advertising, the patriotic feather flags without messages can be used at outdoor events, parades, and fairs to add color to the festivities, especially during certain national holidays. 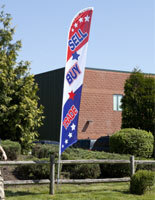 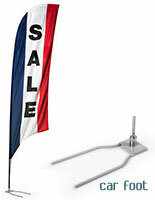 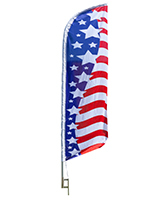 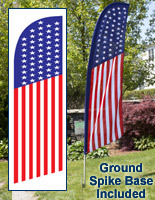 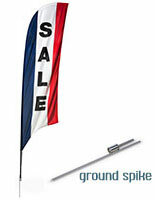 We offer a few different ways to display our flags with most models simply staking into the ground. 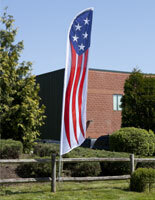 However, other styles allow you to display your flags on hard surfaces like pavements or even at indoor locations. 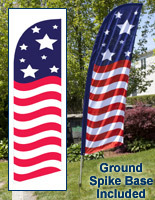 Cross bases that come with fillable water bags provide the necessary ballast to keep the flags upright. 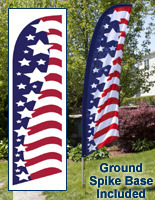 Another option is the hard plastic fillable base; same idea, just different execution. 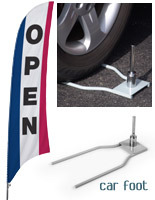 Yet another option is the car foot. 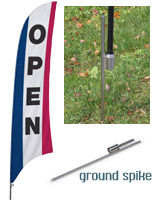 These metal forks are designed to rest beneath parked car tires, holding them in place. 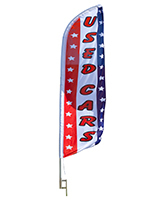 Since displaying flags out in front of the street is one of the main methods auto dealers attract attention, the car foot flags are very popular.